The state of Rajasthan in India is the driest and most arid state. The place of Rajasthan is well known and seen in all its colors during the time of Gangaur. The festival of spring season is dedicated to the goddess of abundance, say the God Gauri. The festival of Gangaur is a largely female-centric festival. Among the most important festivities and pujas, this one is conducted by the women. The fortnight in Gangaur is marked by fasting, daily pujas of Gauri, and on the day of the festival itself, be jewelled and beautifully clothed idol of the goddess is the centrepiece of an elaborate procession. Although Gangaur fairs are held throughout Rajasthan, some places were well known based on the fair. Among the Girasia tribals of the Sirohi Mt Abu region, Gangaur festivities carry on for more than a month, when devotees carry decorated idols of the goddess from village to village, and then they return to the final point where they had started. During this period, unmarried men and women of the tribe choose their mates and develop a state that was followed through the ages and traditions for a longer period and is more or less expected during Gangaur. Gangaur is an extremely important festival of Rajasthan, celebrated in. It commences on the day followed by the festival of Holi and it takes place for 18 days. The festival is celebrated by womenfolk with great enthusiasm and devotion for Gauri, the consort of Lord Shiva. While married women worship Gauri, the perfection and love for the success of their married life, unmarried women worship the Goddess for being blessed with good husband. Gangaur Festival also celebrates monsoon, harvest and marital fidelity. The most important ritual of the colourful festival of Gangaur is the collection of ashes from the Holi fire and burying of wheat and barley seeds in it. These seeds are the religiously watered every day until the germination takes place. The ritual is performed with songs of Isar and Gauri and the varying of pots of water on the head. A week after Holi, women make clay images of Gauri and Isar. The ritual is made colourful and joyous with the traditional folk songs sung in praise of Gauri. On the evening of the seventh day after Holi, unmarried girls take out a parade with ghudlia and singing songs related to it. Ghudlia is an earthen pot with holes around and a lamp inside. On their way, the girls are gifted small presents like sweets, jaggery, ghee, oil and a little cash. The ritual continues for ten days, upto the conclusion of the Gangaur Festival. On the last day girls break their pots and throw the remains into a well or a tank and enjoy a fest with their little collections. However, Gangaur Festival celebration reaches its peak during the last three days of the festival. At this time women take special care to decorate themselves and also the clay images that they had prepared. At an auspicious hour in the afternoon, a procession is taken out to a garden, tank or a well with the images of Isar and Gauri, placed on the heads of married women. Gangaur reflects the rich cultural heritage of Rajasthan and is celebrated with great pomp and show in Bikaner, Jodhpur, Marathwara and Jaisalmer. 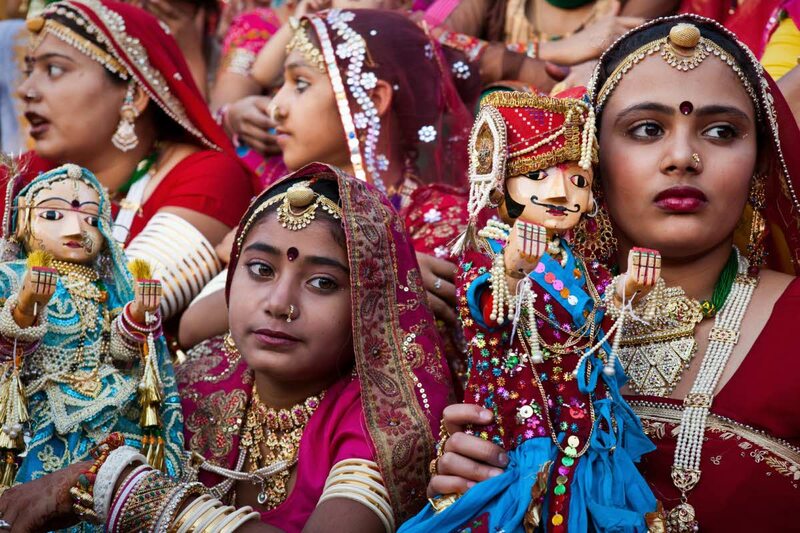 Gangaur Festival is also observed at some places in Gujarat.